Pilot weather reports are the eyes of the skies. They are not only consumed by pilots, but they are critical data for meteorologists as discussed in this earlier blog post. For example, SIGMETs for turbulence and icing often live and die by pilot reports. It’s rare to see a SIGMET issued for severe or extreme turbulence until pilots begin to report those conditions. As such they are an important part of any preflight briefing and are even more valuable as they trickle in over ADS-B while en route. That’s why we’ve given pilot report symbols used in ForeFlight a much needed facelift. 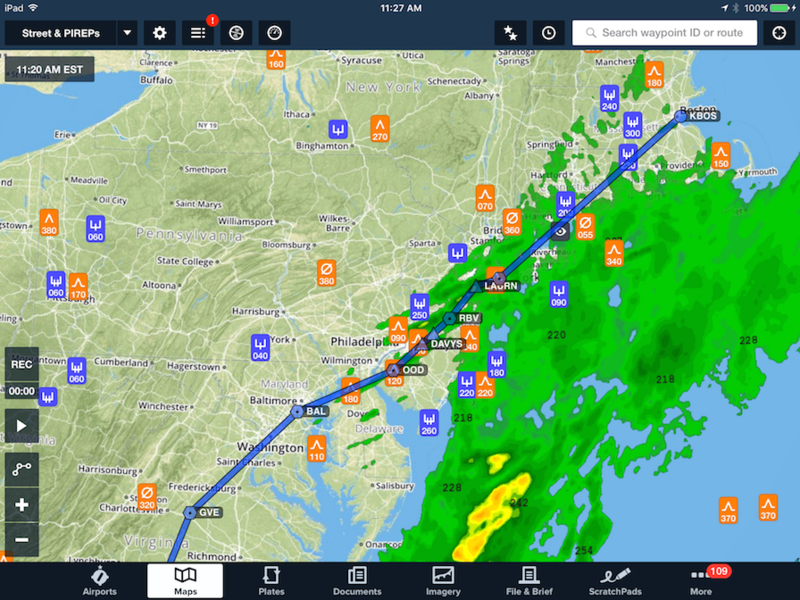 The new ForeFlight pilot weather report symbols help to quickly identify adverse weather along your proposed route of flight. 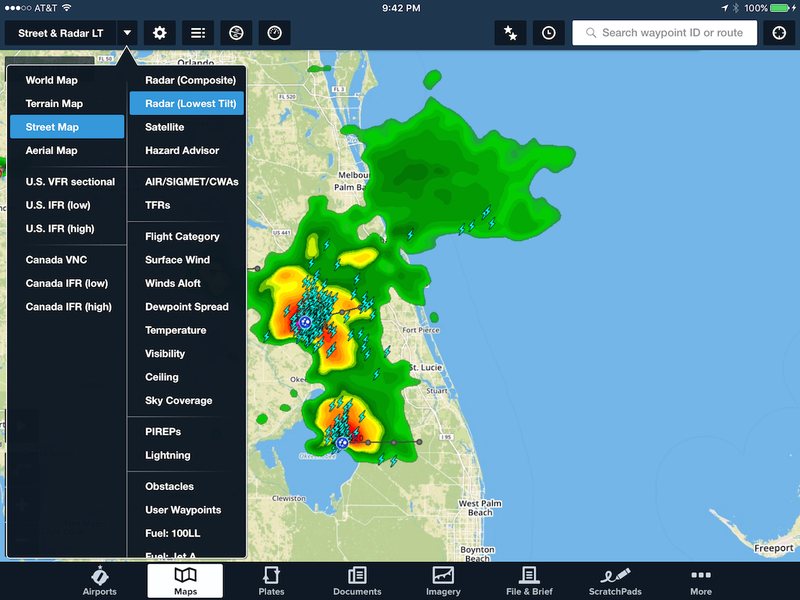 In ForeFlight Mobile 7.5.2, we’ve significantly enhanced the way you see pilot weather reports displayed in the Map view. Prior to this release, pilot reports were loosely organized into three types, namely, turbulence, icing and sky & weather – each represented by a single pilot report symbol (chevron, snowflake and eyeball, respectively). However, this required you to tap on each and every PIREP marker to see important details such as altitude and intensity. 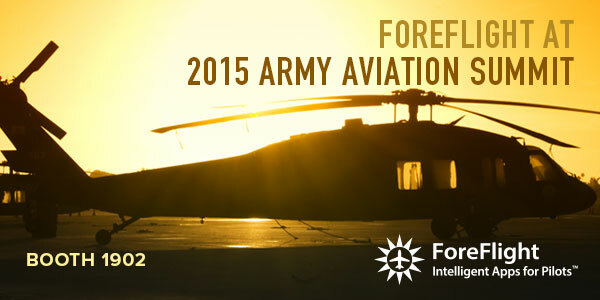 Moreover, routine (UA) and urgent (UUA) pilot reports looked exactly the same. Now, standard pilot report symbology used in this release makes it clear as to the type of report, intensity, altitude (when known) and whether or not it’s an urgent pilot report without the need to tap on the pilot report symbol. So the hunt is over; with the added glance value, the truly nasty weather conditions reported by pilots jumps right out of the glass. Pilots can include all sorts of things in a report, like seeing a flock of geese or even critters camping out on the runway. But reports of adverse weather (or lack thereof) of turbulence and icing are typically made through a subjective estimate of intensity. In order to enhance the glance value and minimize taps to get information, ForeFlight now uses standard pilot report symbols for turbulence and icing reports. Reports that do not contain turbulence or icing details are defaulted to use the legacy sky & weather “eyeball” symbol. These may contain reports of precipitation, cloud bases and cloud tops as well as outside air temperature and winds aloft (speed and direction). 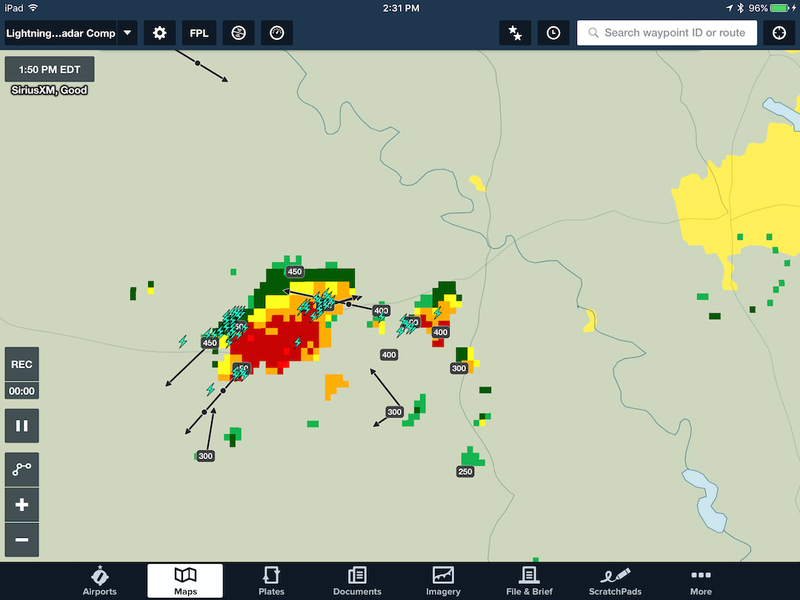 Each icing and turbulence pilot weather report is shown in the ForeFlight Map view with one of the symbols above that depict the reported intensity. From left to right, the top row includes icing intensities of null (negative), light, moderate and severe. Also from left to right, the bottom row includes turbulence intensities of null (negative), light, moderate, severe and extreme. Some intensity reports are “rounded up” to minimize the overall number of icons to remember. For example, you may notice in the symbols above that ForeFlight doesn’t use the official symbol for trace icing. Consequently, a report of trace icing is rounded up to use the light icing symbol. Similarly, we’re not providing a symbol for reports that straddle two intensities such as “moderate to severe.” Therefore, a “light to moderate” turbulence report will be rounded up to use the moderate turbulence symbol; a report of “moderate to severe” turbulence will be rounded up to use the severe turbulence symbol and so on. All urgent pilot reports and reports of a severe nature will be tagged with a red badge to add increased glance value to those reports. 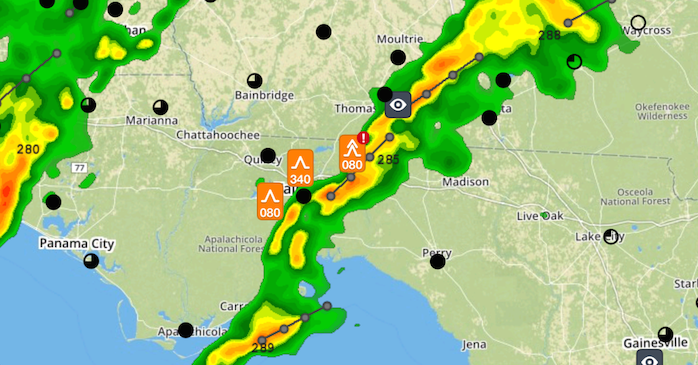 For example, shown here is an urgent pilot weather report for severe turbulence at 8,000 ft MSL in the Florida Panhandle. 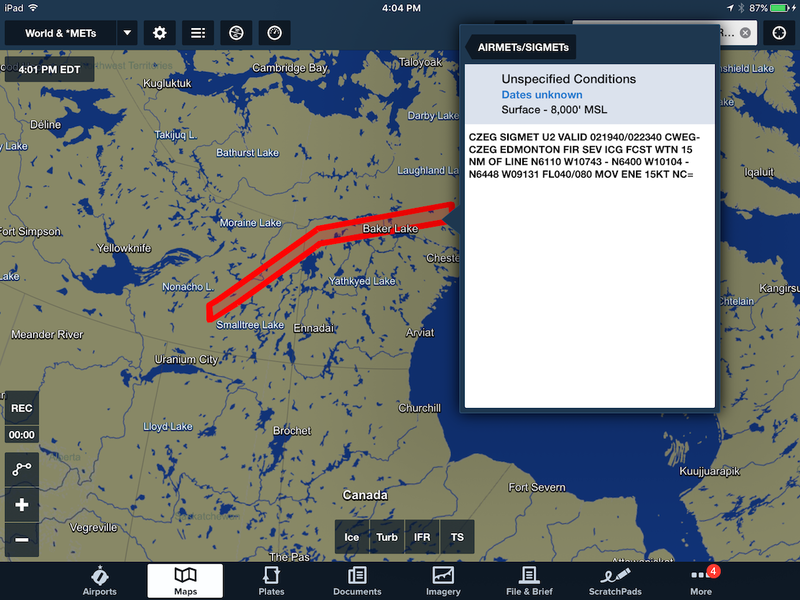 Above and beyond the different turbulence and icing symbols and to further attract your attention, urgent pilot reports in ForeFlight contain a red badge in the upper-right corner like the turbulence report shown above. These badges will typically be included on a turbulence or icing symbol for a report for severe or extreme turbulence and/or severe icing, respectively. However, you may also see a red badge included with a weather & sky report like the one shown below. This is typically an urgent pilot report for low-level wind shear (LLWS) or mountain wave activity that did not also include any turbulence or icing details. Also, reports of hail, tornadoes, waterspouts or funnel clouds will be classified and tagged as urgent. A red badge on a sky & weather (eyeball symbol) pilot report means that the report was tagged as urgent even though no icing or turbulence details were provided. Most of the time this means that low-level wind shear or mountain wave activity was reported by the pilot. If the pilot report contains a flight level (MSL altitude), this flight level is displayed below the symbol using three digits. For example, from the icing pilot report shown below, 057 is added below the symbol which identifies the reported altitude of 5,700 feet MSL. A light icing pilot weather report at 5,700 feet MSL (FL057). On the other hand, when the flight level is unknown (FLUNKN) as it is in the icing pilot report below, we will just show the appropriate symbol (turbulence, icing or sky & weather) without an altitude. Even so, there may be specific altitudes reported, but you’ll have to tap on the pilot report marker to examine the raw report for those details. In this case, light rime ice was reported between 6,000 and 4,500 feet MSL, for example. 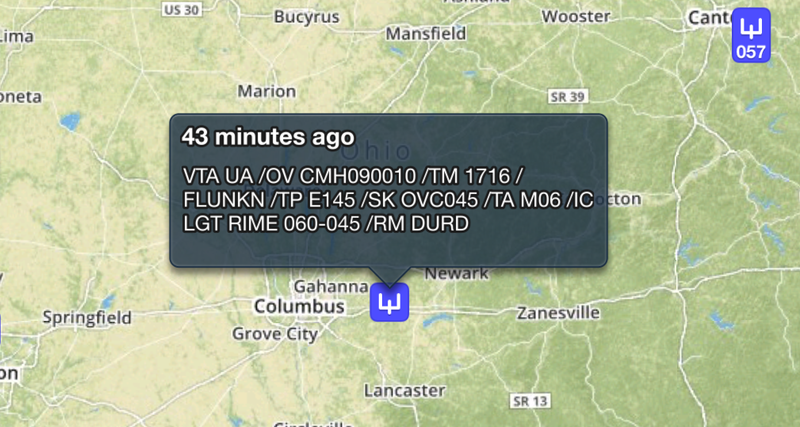 Flight level in this light icing report is unknown (FLUNKN). Tapping on the report reveals more details. If the pilot reported both icing and turbulence in the same report, you will see a pair of symbols side by side like the ones shown below with the center of the symbol pair representing the actual location of the report. This pair of report symbols indicates light icing and light turbulence at 16,000 feet MSL. A pair of reports means that both icing and turbulence details were provided for the altitude shown in the marker. To keep everything consistent you will also see these standard symbols show up when tapping on the Map with the AIR/SIGMET/CWAs layer displayed. AIRMETs for turbulence and icing are displayed with their respective moderate symbol and SIGMETs for turbulence and icing will be displayed with their respective severe symbol. For example, in the list below, it’s very simple now to see that the last item in the popover is a SIGMET for turbulence. Standard symbology is also used in the display of AIRMETs and SIGMETs for icing and turbulence. Even though there’s now more information available at first glance, you will still want to examine the details of any relevant pilot reports by tapping on the specific markers. Like anything new, it may take a little while to get used to the new pilot report icons. But we feel that the use of standard symbology is critical for flight safety and these changes will provide less taps and a much higher glance value for determining the location and altitude of the most nasty weather being reported by pilots. Lastly, keep those pilot weather reports coming; they are important for all stakeholders in aviation safety. 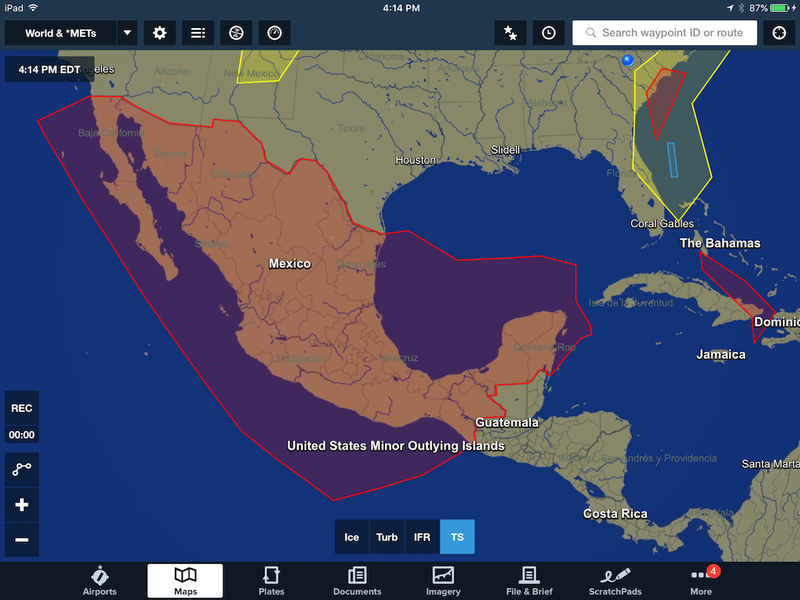 With ForeFlight Mobile 7.4, SIGMETs issued beyond the U.S. border can now be displayed. These International SIGMETs are advisories that cover a wide range of hazards including convection (thunderstorms), severe turbulence, severe icing, tropical cyclone and volcanic ash just to name a few. 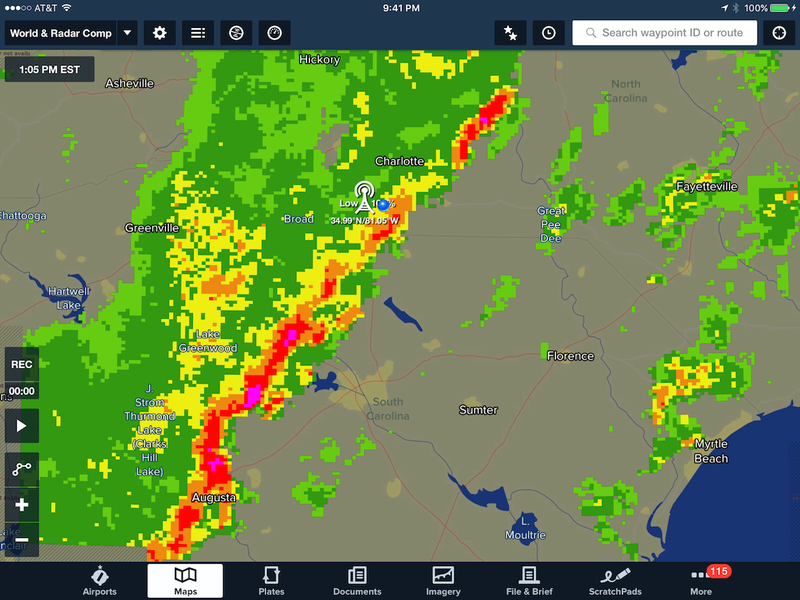 In most cases these are displayed on the ForeFlight Map view as polygons similar to the way domestic AIRMETs, SIGMETs and convective SIGMETs are depicted. To help with all of these new advisories, we’ve also added the ability to filter this layer by the type of hazard. Unlike advisories issued by forecasters in the U.S., International SIGMETs are not always well defined by the source. Occasionally the origin country may not provide the points that define the advisory area. For those situations, the entire Flight Information Region (FIR) is displayed on the Map as is shown below for a hazard within the Mexican FIR. When the source of the SIGMET isn’t specific about the exact location of the hazard, the entire FIR may be outlined in red. Similarly, when tapping on a SIGMET polygon, you may see “Unspecified Conditions” displayed in the title of the popover as shown below. This means the source of the advisory did not specify the details of the type of hazard. 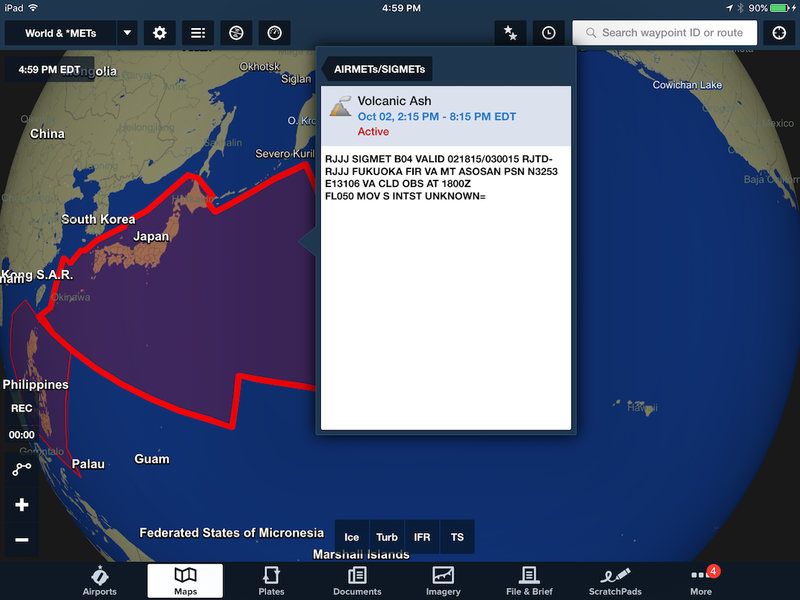 While ForeFlight will make an attempt to determine the hazard by parsing the raw text, there’s no guarantee we will be able to make that determination in every case. In these situations it’s strongly encouraged to review the raw text of the SIGMET for the details. In some cases the type of adverse conditions are not specifically provided by the source government. For those situations, Unspecified Conditions will be shown. You are encouraged to read the raw text for those details. 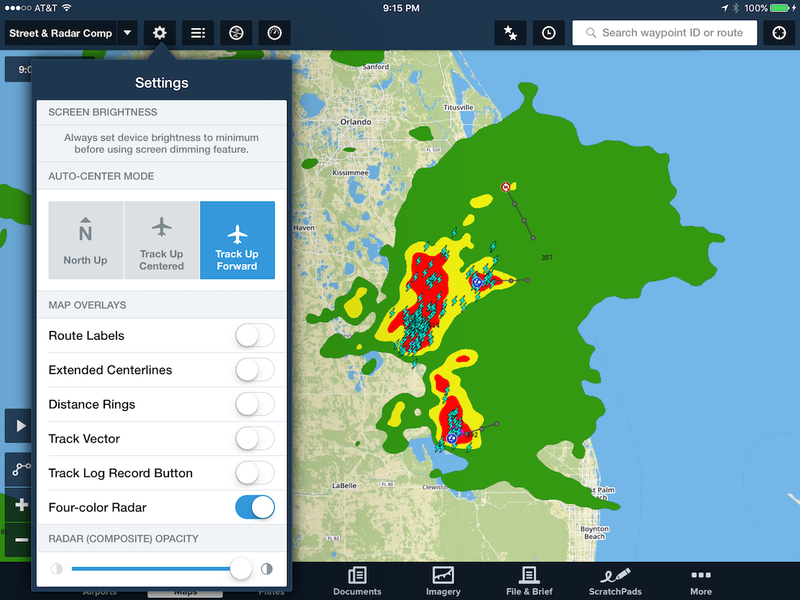 Another feature added to ForeFlight Mobile 7.4 is the ability to filter the AIR/SIGMET/CWAs layer by hazard type. When this layer is displayed, you’ll notice four buttons at the bottom of the Map view labeled Ice, Turb, IFR and TS representing hazards associated with airframe icing, turbulence, IFR conditions and convection, respectively. Tapping on any of these buttons will add or remove advisories for that hazard type from the Map. For example, the Turb, IFR and TS hazards have been filtered with only the Ice hazard displayed as shown below. Please note that these selections are preserved. Therefore, if you’ve removed the layer from the Map or closed the app, the next time you view the AIR/SIGMET/CWAs layer on your device, the hazard selections you made earlier will be restored. When the AIR/SIGMET/CWA layer is active, use the buttons at the bottom to hide or display the advisories by hazard type. The only hazards that are never filtered are those SIGMETs issued for tropical cyclones, radioactive cloud or volcanic ash like the one shown below. These SIGMETs often persist for days or even weeks at a time once they are issued. Not all hazards can be filtered. These include volcanic ash, radioactive cloud and tropical cyclone advisories. The Prog Charts that pilots have been using for the last decade or two (pictured below) will be undergoing a facelift sometime in September 2015. 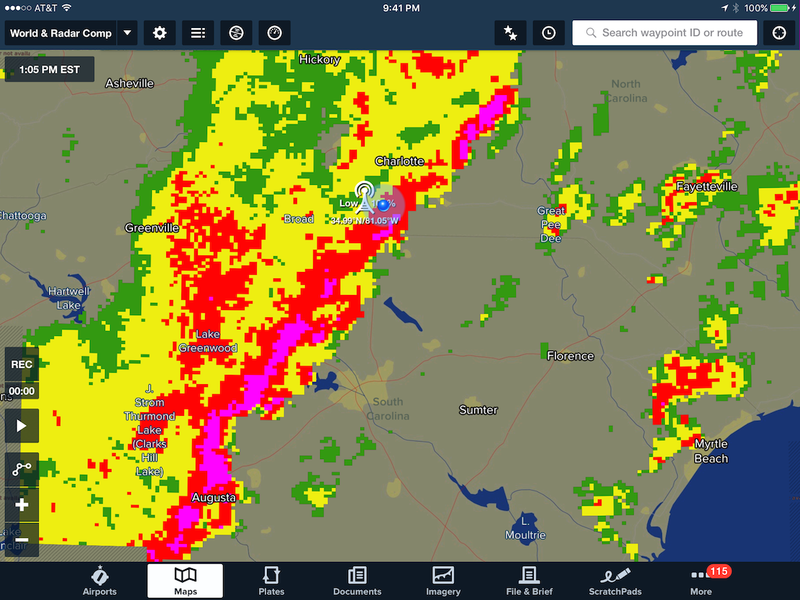 So at ForeFlight we’re giving you the opportunity to test drive the new charts before they become operational and are officially released by the National Weather Service (NWS). We’ve added these forecasts to our USA Ensemble Imagery and you can find them under the NDFD Progs collection as shown below. 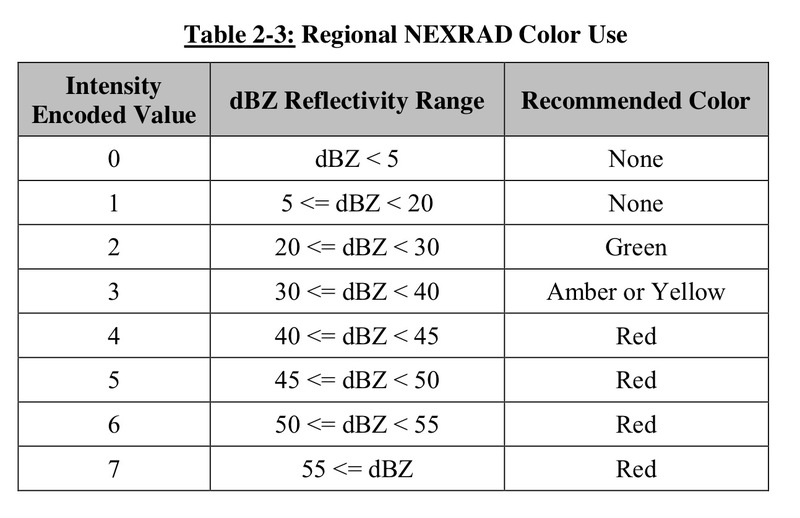 The current Prog Charts are issued by highly experienced meteorologists at the Weather Prediction Center (WPC) in College Park, Maryland; that won’t change. The new implementation will still use the fronts and sea level pressure (SLP) forecast issued by those same meteorologists at the WPC, however, the precipitation forecast represented by those pale green lines is being replaced. The new instantaneous precipitation forecast is now being extracted from the National Digital Forecast Database (NDFD). Instead of the green contours, you’ll see the new precipitation forecast as shaded and outlined regions like the ones shown below. Example of the new NDFD Progs. The new NDFD Prog Charts contain a mosaic of digital precipitation forecasts issued from all of the local NWS weather forecast offices (WFOs) throughout the United States working in collaboration with the National Center for Environmental Prediction (NCEP) and WPC. The forecasts depicted combine the familiar WPC forecasts of fronts, isobars and high and low pressure centers with the NDFD depiction of expected weather type and likelihood. 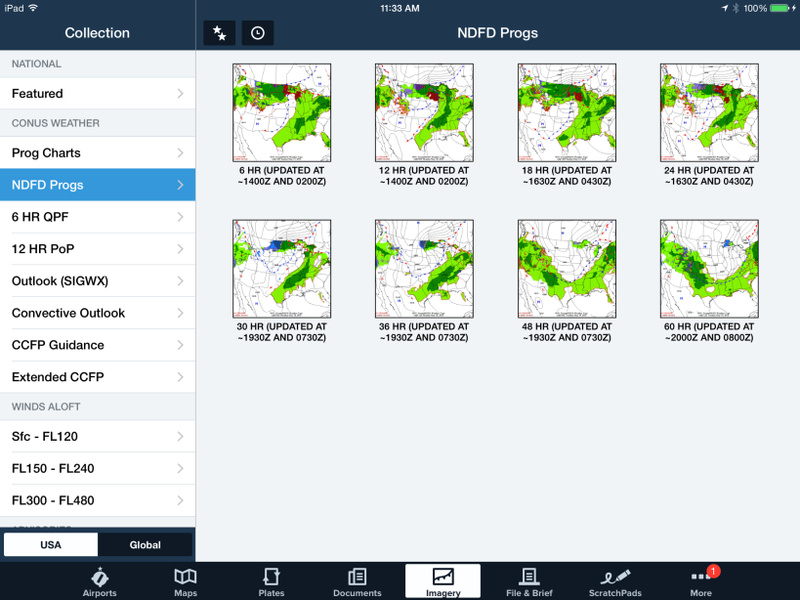 The precipitation presented on the new NDFD Progs is forecast coverage just like its legacy counterpart. So it is valid at the time posted on the chart and not over a period of time. Using a color-coding, the legend in the lower left corner of the image describes the precipitation type or weather expected (rain, snow, mixed, ice and thunderstorm) as well as the likelihood (chance versus likely) that the precipitation will occur. Definitions for the various weather types depicted on the NDFD Progs. We know that it’ll take some time to become completely comfortable with the new forecast depiction of precipitation, but give them a try now so you’ll be way ahead of other pilots come September. ForeFlight for Apple Watch. Coming Soon. Apple Watch is the first product Apple has designed to be worn and represents a new chapter in the relationship pilots have with technology. 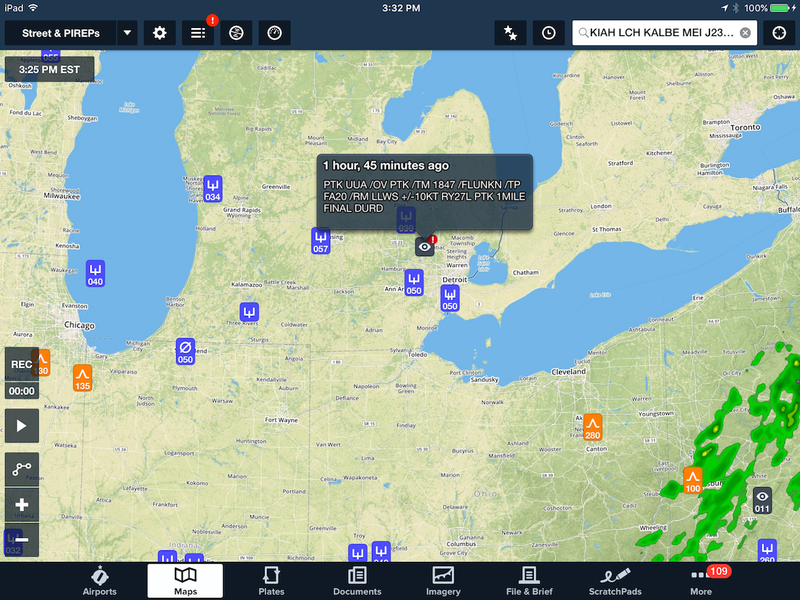 It brings a fresh opportunity for ForeFlight designers and developers to deliver new experiences that make interacting with ForeFlight Mobile and important flight information easier and more personal. We are excited to share with you this preview of ForeFlight for Apple Watch. With a flick of the wrist, ForeFlight displays nearby flight conditions, as well as local and zulu time using the Apple Watch Glances feature. Know when flight conditions are above minimums and forget having to do local to zulu time conversions in your head! 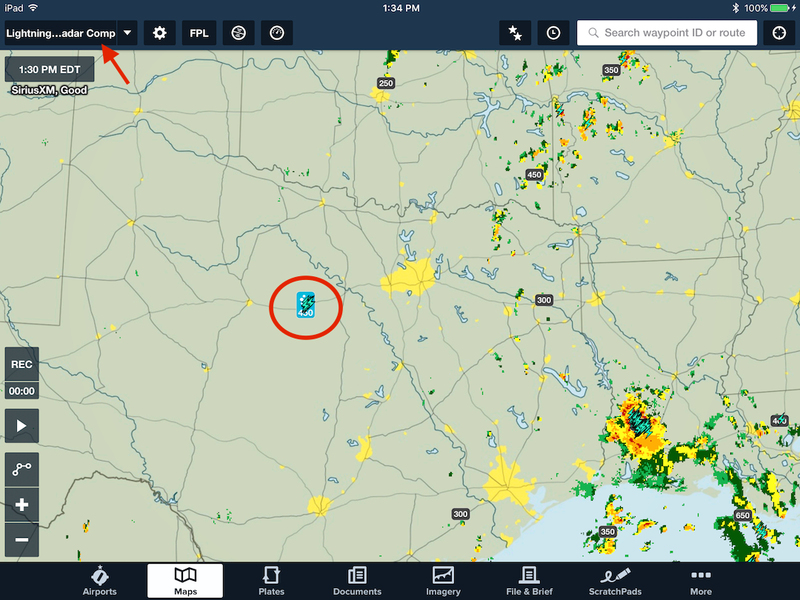 With a Stratus on board and connected to iPhone, ADS-B weather is delivered right to ForeFlight for Apple Watch. 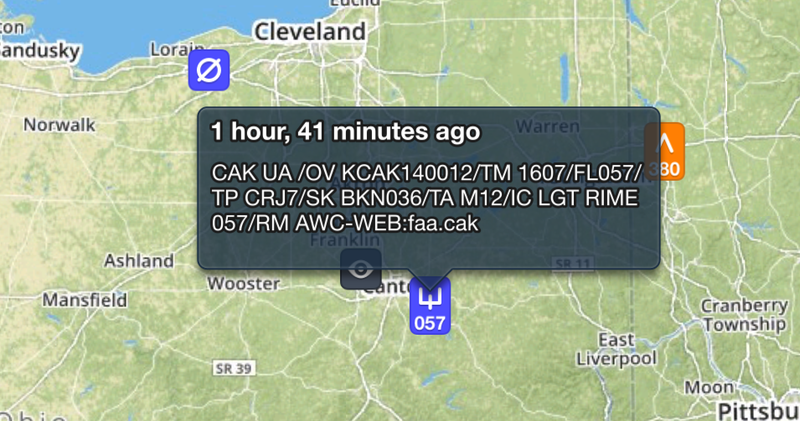 In flight and on the ground, easily view current METARs for airports in your recents and favorites lists. A customizable dashboard of flight instruments helps you keep track of information like ETE, ETA, distance to destination, track, ground speed, GPS altitude, and more. Configure the instrument layout to suit your preferences. Apple Watch delivers the ForeFlight flight notifications that you are used to, but in a more convenient way. Get a discreet wrist tap as soon as an expected route clearance is issued. 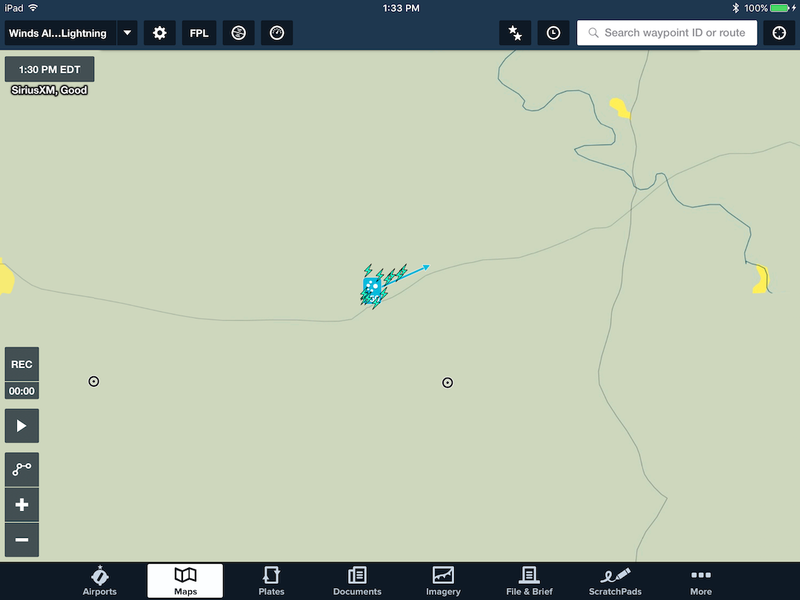 Keep tabs on total flight time or timed approaches in the Timers view. An iPhone 5 or later running iOS 8.2 or higher is required to run ForeFlight for Apple Watch. The iPhone installs supported applications on Apple Watch and manages communications between the devices. Without an iPhone, you cannot install Apple Watch applications at this time. Pre-orders begin today and Apple Watch goes on sale April 24th.